Identification: Moyle (1976a); Scott and Crossman (1973); Wydoski and Whitney (1979); Morrow (1980); Eschmeyer et al. (1983); Page and Burr (1991). Dark dorsal side, bluish to greenish. Sides grayish or whitish with dark spots towards dorsal side. Faint horizontal darker stripe near where spots end. Spawning males and females take on a pinkish to reddish tone along their usually bland sides. Native Range: Arctic and Pacific drainages from Point Hope, Alaska, to Monterey Bay, California, infrequently as far south as Chamalu Bay, Baja California. Also in northeastern Asia (Page and Burr 1991). Table 1. States with nonindigenous occurrences, the earliest and latest observations in each state, and the tally and names of HUCs with observations†. Names and dates are hyperlinked to their relevant specimen records. The list of references for all nonindigenous occurrences of Oncorhynchus kisutch are found here. 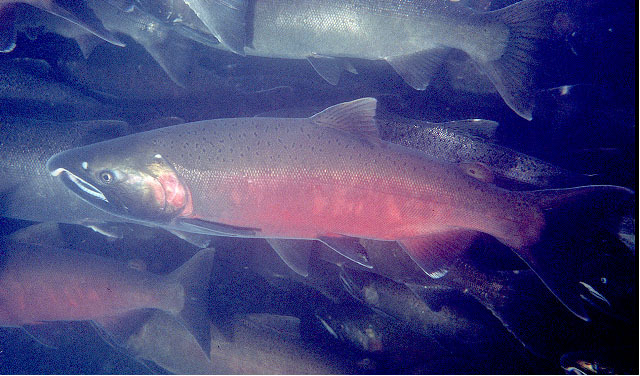 Means of Introduction: Introductions of coho salmon as sport fish began as early as the 1920s. The coho was introduced into the Great Lakes to control the alewife population (Eddy and Underhill 1974). The first stocking in the Great Lakes was in Lake Erie in 1933 by the Ohio Division of Conservation (Parsons 1973). The first large planting in the Great Lakes occurred in 1966 in Lakes Michigan and Superior. The species had been stocked in all the Great Lakes by 1970 (Parsons 1973). A total of 16 million fish had been stocked in the Great Lakes between 1966 and 1970 (Parsons 1973). Fish intentionally stocked into coastal New Hampshire in the late 1960s dispersed to Maine and Massachusetts (Stolte 1974). It was introduced into the Colorado River in 1967 (Rinne 1995). Colorado first began stocking cohos in the early 1900s (Everhart and Seaman 1971). Originally, the stock used for Colorado came from Oregon; more recently stock from Lake Michigan has been used (Everhart and Seaman 1971). Introduced into Connecticut since the late 1800s (Whitworth 1996). Most attempts to establish populations failed; therefore, stocking was discontinued. Status: Some reproduction reported in Lake Erie, Lake Michigan, Lake Superior, Manistee River in Michigan, coastal waters of New Hampshire, Maine, and Massachusetts, Salmon River in New York, and Colorado River in Arizona. Stockings in Tennessee failed. Rinne (1994) lists coho salmon as not established in the Colorado River in Arizona. The first evidence of reproduction in the Great Lakes came in 1968 from tributaries of Lakes Michigan and Superior (Parsons 1973). Natural reproduction in Lake Michigan and Lake Superior have resulted in localized self-sustaining populations (Downs et al. 2002). There are no known established populations in Connecticut (Whitworth 1996) or Delaware (Raasch and Altemus 1991). Coho salmon are no longer stocked in Lake Erie, although strays from the other Great Lakes can still be caught occasionally (ODNR 2007). Impact of Introduction: Coho salmon compete with native lake trout Salvelinus namaycush (Page and Laird 1993). Fausch and White (1986) found that coho salmon may compete with brook trout S. fontinalis and brown trout Salmo trutta for food and space in the Great Lakes if resources become scarce. Coho have an advantage over brook and brown trout because of an earlier emergence and a larger size at emergence (Fausch and White 1986). Remarks: Coho salmon has not been stocked in Oklahoma (Pigg, personal communication). Parsons (1973) gave detailed stocking information for the Great Lakes. Voucher specimens: Montana (USNM 104701). Anonymous. 2000. Northwestern PA. waters. James's Northeastern Fishing Guide. Baxter, G.T., and J.R. Simon. 1970. Wyoming fishes. Wyoming Game and Fish Department Bulletin 4, Cheyenne, WY. 168 pp. Bence, J.R., and K.D. Smith. 1999. An overview of recreational fisheries of the Great Lakes. In Taylor, W.W., and C.P. Ferreri (Eds. ), Great Lakes Fisheries Policy and Management: A Binational Perspective. Michigan State University Press, East Lansing, MI, pp. 259-306. Bond, C.E. 1973. Keys to Oregon Freshwater Fishes. Oregon State University Agriculture Experimental Station Technical Bulletin 58:1-42, revised. Bond, C.E. 1994. Keys to Oregon Freshwater Fishes. Oregon State University Bookstores, Inc., Corvallis. 58:1-42, revised. Brown, R.W., M. Ebener, and T. Gorenflo. 1999. Great Lakes commercial fisheries: historical overview and prognosis for the future. In Great Lakes Fisheries Policy and Management: A Binational Perspective. Taylor, W.W., and C.P. Ferreri (Eds.). Michigan State University Press, East Lansing, MI, pp. 307-354. Burr, B. M. 1991. The fishes of Illinois: an overview of a dynamic fauna. Proceedings of our living heritage symposium. Illinois Natural History Survey Bulletin 34(4):417-427. Burr, B.M., and L.M. Page. 1986. Zoogeography of fishes of the lower Ohio-upper Mississippi basin. Pages 287-324 in C. H. Hocutt, and E. O. Wiley, editors. The Zoogeography of North American Freshwater Fishes. John Wiley and Sons, New York, NY. Burr, B.M., and M.L. Warren, Jr. 1986. A distributional atlas of Kentucky fishes. Kentucky Nature Preserves Commission Scientific and Technical Series 4. 398 pp. Cincotta, D. - West Virginia Department of Natural Resources, Annapolis. Cross, F.B., R.L. Mayden, and J.D. Stewart. 1986. Fishes in the western Mississippi drainage. Pages 363-412 in C.H. Hocutt, and E.O. Wiley, editors. The Zoogeography of North American Freshwater Fishes. John Wiley and Sons, New York, NY. Crawford, S.S. 2001. Salmonine introductions to the Laurentian Great Lakes: an historical review and evaluation of ecological effects. Canadian Special Publication of Fisheries and Aquatic Sciences No. 132. 205 pp. Cudmore-Vokey, B., and E.J. Crossman. 2000. Checklists of the fish fauna of the Laurentian Great Lakes and their connecting channels. Canadian Manuscript Report of Fisheries and Aquatic Sciences 2500: v + 39 pp. Denoncourt, R.F., T.B. Robbins, and R. Hesser. 1975a. Recent introductions and reintroductions to the Pennsylvania fish fauna of the Susquehanna River drainage above Conowingo Dam. Proceedings of the Pennsylvania Academy of Science 49:57-58. Downs, W., L. Wiland, E.A. White, and S. Wittman. 2002. Coho Salmon/Fish of the Great Lakes. University of Wisconsin Sea Grant Institute. http://www.seagrant.wisc.edu/greatlakesfish/cohosalmon.html (Accessed 3/4/2011). Emery, L. 1985. Review of fish introduced into the Great Lakes, 1819-1974. Great Lakes Fishery Commission Technical Report, volume 45. 31 pp. Eschmeyer, W.N., E.S. Herald, and H. Hamann. 1983. A Field Guide to Pacific Coast Fishes of North America. Peterson Field Guide Series. Houghton Mifflin Co., Boston, MA. Everhart, W.H., and W.R. Seaman. 1971. Fishes of Colorado. Colorado Game, Fish and Parks Division, Denver, CO. 75 pp. Everhart, W.H. 1976. Fishes of Maine. Maine Department of Inland Fisheries and Wildlife. Augusta, ME. 96 pp. Fausch, K.D., and R.J. White. 1986. Competition among juveniles of coho salmon, brook trout, and brown trout in a laboratory stream, and implications for Great Lakes tributaries. Transactions of the American Fisheries Society 115(3):363-381. Harlan, J.R., E.B. Speaker, and J. Mayhew. 1987. Iowa fish and fishing. Iowa Department of Natural Resources, Des Moines, IA. 323 pp. Hartel, K.E. 1992. Non-native fishes known from Massachusetts freshwaters. Occasional Reports of the Museum of Comparative Zoology, Harvard University, Fish Department, Cambridge, MA. 2. September. pp. 1-9. Hartel, K.E., D.B. Halliwell, and A.E. Launer. 1996. An annotated working list of the inland fishes of Massachusetts, University of Massachusetts, Cambridge, MA (Available from http://www.mcz.harvard.edu/fish/ma_fam.htm. Page accessed March 5, 1998). Hildebrande, S.G. 1971. The effect of coho spawning on the benthic invertebrates of the Platte River, Benzie County, Michigan. Transactions of the American Fisheries Society 100:61-68. Hocutt, C.H., R.E. Jenkins, and J.R. Stauffer, Jr. 1986. Zoogeography of the fishes of the central Appalachians and central Atlantic Coastal Plain. Pages 161-212 in C.H. Hocutt, and E.O. Wiley, editors. The Zoogeography of North American Freshwater Fishes. John Wiley and Sons, New York, NY. Hoover, E.E. 1936. Preliminary biological survey of some New Hampshire lakes. New Hampshire Fish and Game Department. Survey Report No. 1. Concord, NH. Howells, R.G. 1992a. Annotated list of introduced non-native fishes, mollusks, crustaceans and aquatic plants in Texas waters. Texas Parks and Wildlife Department, Management Data Series 78, Austin, TX. 19 pp. Idaho Fish and Game. 1990. Fisheries Management Plan 1991-1995. Idaho Department of Fish and Game. Idaho Fish and Game. 1997. Official list of Idaho record fish (as of November 15, 1996). (Available from http://www.state.id.us/fishgame/fishrecs.htm. Page accessed June 26, 1997). Kendall, W.C. 1914. The Fishes of New England. The Salmon Family. Part I - the trout or charrs. Memoirs of the Boston Society of Natural History 8(1). 103 pp + plates. Kocik, J.F., and M.L. Jones. 1999. Pacific salmonines in the Great Lakes basin. In Taylor, W.W. and C.P. Ferreri, (Eds.). Great Lakes Fisheries Policy and Management: A Binational Perspective. Michigan State University Press, East Lansing, MI, pp. 455-488. Minckley, W.L. 1973. Fishes of Arizona. Arizona Fish and Game Department. Sims Printing Company, Inc., Phoenix, AZ. Morris, J., L. Morris, and L. Witt. 1974. The Fishes of Nebraska. Nebraska Game and Parks Commission, Lincoln, NE. 98 pp. Moyle, P.B., and R.A. Daniels. 1982. Fishes of the Pit River System, McCloud River System, and Surprise Valley Region. University of California Publications, Zoology 115:1-82. North Dakota Fish and Game. 1994. Fishes of the Dakotas. Brochure. North Dakota Game and Fish Department, Bismark, ND. ODNR. 2007. Coho salmon. Ohio Department of Natural Resources. http://www.dnr.state.oh.us/Default.aspx?tabid=22743 (Accessed 3/4/2011). Page, L.M., and C.A. Laird. 1993. The identification of the nonnative fishes inhabiting Illinois waters. Report prepared by Center for Biodiversity, Illinois Natural History Survey, Champaign, for Illinois Department of Conservation, Springfield. Center for Biodiversity Technical Report 1993(4). 39 pp. Parmenter, R.R., and Lamarra, V.A. 1991. Nutrient cycling in a freshwater marsh: The decomposition of fish and waterfowl carrion. Limnology and Oceanography 36(5):976-987. Parsons, J.W. 1973. History of salmon in the Great Lakes, 1850-1970. U.S. Bureau of Sport Fisheries and Wildlife Technical Paper 68. 80 pp. Pigg, J. - State of Oklahoma Department of Environmental Quality, Oklahoma City. Raasch, M.S., and V.L. Altemus, Sr. 1991. Delaware's freshwater and brackish water fishes - a popular account. Delaware State College for the Study of Del-Mar-Va Habitats and the Society of Natural History of Delaware. 166 pp. Rand, P.S., C.A.S. Hall, W.H. McDowell, N.H. Ringler, and J.G. Kennen. 1992. Factors limiting primary productivity in Lake Ontario tributaries receiving salmon migrations. Canadian Journal of Fisheries and Aquatic Sciences 49(11):2377-2385. Rinne, J.N. 1995. The effects of introduced fishes on native fishes: Arizona, southwestern United States. Pages 149-159 in D.P. Philipp, J.M. Epifanio, J.E. Marsden, and J.E. Claussen, editors. Protection of Aquatic Biodiversity. Proceedings of the World Fisheries Congress, Theme 3. Science Publishers Inc., Lebanon, NH. Scarola, J.F. 1973. Freshwater fishes of New Hampshire. New Hampshire Fish and Game Department, Division of Inland and Marine Fisheries. 131 pp. Schmidt, R.E. 1986. Zoogeography of the Northern Appalachians. Pages 137-160 in C.H. Hocutt, and E.O. Wiley, editors. The Zoogeography of North American Freshwater Fishes. John Wiley and Sons, New York, NY. Scott, W.B., and E.J. Crossman. 1973. Freshwater Fishes of Canada. Fisheries Research Board of Canada, Bulletin 184. Ottawa. 966 pp. Sigler, W.F., and R.R. Miller. 1963. Fishes of Utah. Utah Department of Fish and Game, Salt Lake City, UT. 203 pp. Sigler, W.F., and J.W. Sigler. 1996. Fishes of Utah. University of Utah Press, Salt Lake City, UT. 375 pp. Simon, T.P., J.O. Whitaker, Jr., J.S. Castrale, and S.A. Minton. 1992. Checklist of the vertebrates of Indiana. Proceedings of the Indiana Academy of Science 101:95-126. Smith, C.L. 1985. The inland Fishes of New York State. New York State Department of Environmental Conservation, Albany, NY. 522 pp. Stolte, L.W. 1974. Introduction of coho salmon into the coastal waters of New Hampshire. Progressive Fish-Culturist 36(1):29-32. Sublette, J.E., M.D. Hatch, and M. Sublette. 1990. The fishes of New Mexico. New Mexico Department of Game and Fish, University of New Mexico Press, Albuquerque, NM. 393 pp. Tyus, H.M., B.D. Burdick, R.A. Valdez, C.M. Haynes, T.A. Lytle, and C.R. Berry. 1982. Fishes of the upper Colorado River basin: distribution, abundance, and status. Pages 12-70 in W.H. Miller, H.M. Tyus, and C.A. Carlson, editors. Fishes of the upper Colorado River system: present and future, Western Division, American Fisheries Society. Walker, B.W., R.R. Whitney, and G.W. Barlow. 1961. Fishes of the Salton Sea. Pages 77-92 in B.W. Walker, editor. The ecology of the Salton Sea, California, in relation to the sport fishery of California. Fish Bulletin of the California Department of Fish and Game 113. Wiltzius, W.J. 1985. Fish culture and stocking in Colorado, 1872-1978. Division Report 12. Colorado Division of Wildlife. Whitworth, W.R. 1996. Freshwater Fishes of Connecticut. State Geological and Natural History Survey of Connecticut, Bulletin 114.